Had a very quick trip back home this past weekend. This was my first time back in DC since moving to Chicago in September. I was only going to be in DC for a few hours and decided not to advertise in advance that I was coming for fear that I would be stretched too thin trying to see all the people I wanted to see. It was hard to figure out who to spend my time with. So I went back and counted the number of emails I received from DC friends since I had moved and decided to reward the most frequent emailer with dinner with me. The winner: my buddy Aaron. But I need to make another, longer visit to DC just to see my friends and be social. I miss them. But 98% of my weekend was spent with my family - my crazy, nutty, hysterical family. No place on earth makes me laugh as much as being with my siblings. On Saturday, we all ventured to watch my 11 year old neice play basketball in my high school gym. It was the first time since graduation that I had been in that room, and true to form it seems so much smaller now. I was resisting the urge to go for a walk through the school, as this is the final year this building will stand. 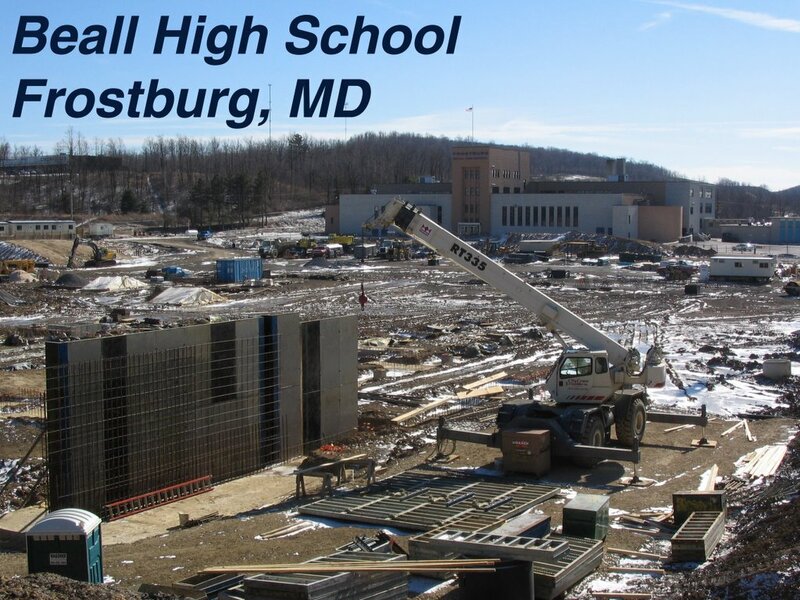 Construction on a new high school has already begun (as seen in the foreground of the picture below) and the demolition on my school will occur sometime this summer. 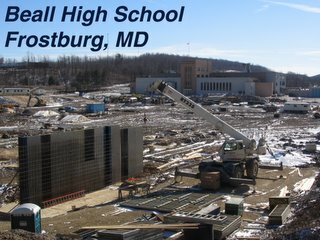 The building was erected in 1944 and resembles a prison (as seen in the background of the picture below) but it holds so many memories that it will be difficult to drive through town and not see it anymore. Sunday afternoon, my ever-social-hostess mother invited family in to visit with me since I didn't make it home for Christmas and she thinks my life is lacking because of it. There are only so many ways to respond to "so how's Chicago? ", and after the 43rd time it's almost unbearable. But it was nice to see everyone nonetheless. Although my fave cousin was out of town. Monday (and the real reason I went home) was my checkup with the surgeon who operated on me back in August. This was an exam to see how things have progressed, how my incision is healing, how the heart is pumping, etc. So far, everything seems good and I am happy to report that I am almost back at 100%. Running late after having lunch with my best friend, Jeff, I made it to the airport just in time to get bumped off of my flight thanks to overbooking. But I got a free round trip ticket to anyplace USAir flies in the country, so it wasn't all bad. Looking back on my weekend, I realize I miss my family more than I thought. I am just so lucky that we all get along and genuinely enjoy being around each other. In the case of sibling rivalry, our biggest contest is who can make the others laugh to tears. It happens every time all 4 of us are together. I am lucky that way. I am lucky alot of ways. And looking back on last year and all that I got from it, I am the luckiest man I know. I would have emailed you this question, but when I click on the email me link a box opens up directly to outlook and since outlook is not connected to our server I can't read your email address. Anyway my question is: Are you adopted or were you being facecious (sp?). I read your vault of postings a few weeks ago and in one of them I remember you said something about being told at 18 that you were adopted, but then later on you talk about your heritage being Welsh from your dad. Not that it matters I just wanted to clear that up in my head. Thanks for sharing your life, I've enjoyed your entries. I like your site, it might be the most uplifting "gay blog" that I know. Glad to hear about the good bill of health, too! Haven't stopped by in a while to read your blog. Guess I hit it right. Family is the best! Sounds like you had an action-packed weekend. It's good to hear you are running in near top form again. Quite the run since August , aye?!?! Are you surviving the colder temps in Chicago for winter? The west coast is still getting good weather. From The "You Get What You Pay For" Dept.